Wanna build your own Arcade Game Machine? Check out this DIY Kit for Arcade MAME JAMMA Game Project. The encoder board works perfect on Windows system without any drivers. It is 100% Zero Delay. Each Encoder has its own USB Cable so that it does not affect another player. If you need to build a multiplayer Arcade Machine, just purchase a few more sets. The Zero delay is the most cost effective encoder available. 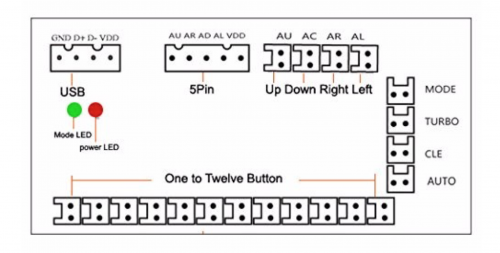 All you need is to connect your arcade controls to the board with the included wires, plug the encoder into your computer and enjoy arcade controls for gaming such as MAME, PC gaming and console emulation. USB: hook up USB wire cable and connect it to your Raspberry Pi or PC. AU: Up Direction, you can just hook up a button, it's a digital port, just like a switch. In this case, you can just hook up 4 cable wire(blue and white wire pair) to your joystick that we've provided in this kit. 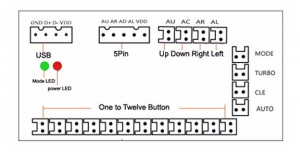 Mode: means you can shift mode from "analog mode" to "digital mode" when you short this port with a button. it'd have the effect of pressing the button really quickly if you just hold it down. The Turbo function makes it as if you are mashing a button repeatedly, such as the A Button. This is useful in some Gamecube games in situations where you must press a certain button over and over again. The Clear button stops the Turbo. When the function key and AUTO key are being turned on, the function key to enter AUTO-FIRE mode, and the corresponding DLED or ALED to 12Hz flicker frequency. When the key and CLR key are being pressed, exit AUTO-FIRE mode, and DLED or ALED will return to steady state. This page was last edited on 26 June 2018, at 06:56.